Should I buy a used air conditioner? • The Air Geeks, reviews of air conditioners, dehumidifiers and air purifiers. 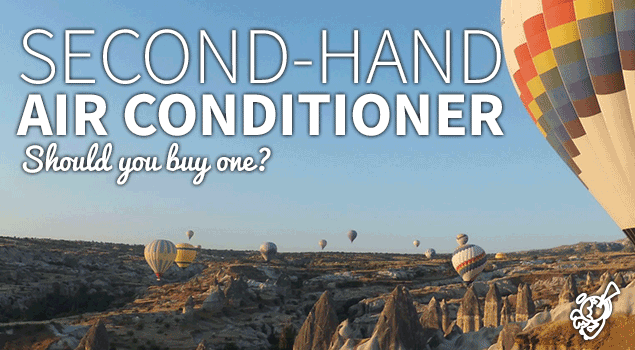 Blog, Portable Air Conditioners » Should I buy a used air conditioner? Should I buy a used air conditioner? An air conditioner is one of the appliances that you should consider if you are planning to transform the environment of your bedroom, office, kitchen, and so on. If you are intending to buy an air conditioner for your room, you are most likely not sure whether you should buy a new one or a used unit. Considering that you could be undecided, we have researched to provide you with the pros and cons of buying a used air cooling system. Without further ado, we will start with the pros. To start with, the cost of buying a used appliance is usually lower as compared to that of buying a brand new one. This means that you can get a used air cooling system at nearly half the price of a new one. In case you are planning to save money, then you should consider buying used air conditioners. If you are lucky to get a near-new air conditioner, it can serve you for years just like a new one would do. This means that there will be no additional repair costs. Most dealers inspect and test used appliances before selling them to their customers. Chances of buying a faulty item from such dealers are usually low. Unlike brand new air cooling systems, used air conditioners have limited warranty periods. In some cases, the warranty only covers specific parts of the appliance. Nevertheless, some dealers will allow you to extend the length of the warranty by paying more for the item. If the appliance that you are buying has been used for a long time, then there are high chances that you will spend more on repairs. For most people, the general appearance of an item matters. Most used air conditioners have scrape marks and dents and they are therefore not attractive in appearance. If you are looking for a sparkling air conditioner, then you should consider buying a brand new unit. If you are buying a used item, then there are high chances that the manufacturer has stopped producing that item. Getting replacement parts for such an appliance can be stressful. It is therefore important to look for more information about an appliance before purchasing it. For overused items, you can end up spending a lot of money in repairing them. To avoid this, you should look for items that are in near new conditions. Although they attract higher prices, the cost of repairing them is usually lower. If you were undecided whether to buy new or used air conditioners, we are sure that this information will help you to make a well informed decision. In case your budget is limited, then a used air conditioner is a suitable choice.